Since 2014, the Louisiana Department of Health’s Well-Ahead Louisiana initiative and Office of Behavioral Health (OBH) have partnered to address tobacco use in the behavioral health population. The partnership has allowed for better data collection that shows a large percentage of callers to the Quitline also have a mental illness. Controversy continues to surround the optimal time for women to get their initial screening mammogram, Diagnostic mammograms (unlike screening mammograms) can be started at any age since they are used to “diagnose” palpable masses (lumps) or other abnormal masses or lesions discovered on exam. But true screening mammograms (in the absence of a visible or noticeable lump) continue to pose a particular dilemma. The flu, also known as influenza, is more dangerous than the common cold for children and poses a serious threat to the health and well-being of children and their families each year. Children commonly need medical care because of the flu, especially before they reach the age of five, and each year an average of 20,000 children under the age of five are hospitalized because of flu complications. If there is one thing Louisiana knows how to handle, it’s a hurricane. And I guess you can add floods, tornadoes, and other various natural disasters to the list. Although our southern location provides many jobs and vital resources, it also makes us vulnerable to the elements. Mold. Snakes and other reptiles. Sharp objects. Deep water, and possibly contaminated drinking water. These are all hazards that people face when returning home to a flooded house or structure. The Louisiana Department of Health advises all residents to be aware of the dangers flood waters pose and to take all appropriate precautions. Back-to-school season is here! It’s time for parents to gather school supplies and back packs. It’s also the perfect time to make sure your children are up to date on their vaccines. Board members and staff of the Louisiana Emergency Response Network watched and listened in horror to the breaking news coverage of the recent shooting rampage that erupted on a community baseball field in Virginia, which critically injured Louisiana Congressman Steve Scalise. The LERN family extends our best wishes for a full recovery to Congressman Scalise. This senseless act of violence serves as the latest reminder that immediate and appropriate medical response to severe traumatic injury can save lives. No doubt, the medical response to this “ballpark shooting” incident will be carefully studied and analyzed for lessons learned – two basic facts of this case are already being cited as probable lifesavers. In the seven years since the Affordable Care Act was passed, more than 575,000 Louisianans have gained health care coverage. This includes more than 433,000 newly covered adults who are enrolled in Medicaid in the past 12 months, and another 143,000 plus people who have gained private health coverage through the ACA exchange, or the Marketplace. Ruth Kennedy, a former Medicaid director with the Louisiana Department of Health, recently retired from our department. 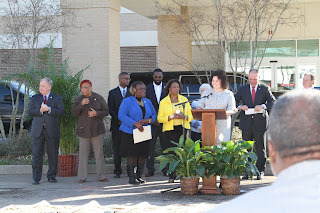 Ms. Kennedy is a nationally recognized expert in helping eligible individuals enroll in Medicaid services. Her expertise in designing and implementing outreach, enrollment and retention strategies resulted in Louisiana becoming a national leader in children’s coverage through the Children’s Health Insurance Program, or LaCHIP. Colorectal cancer remains a significant problem in Louisiana. Even though we have a highly effective screening method (i.e. colonoscopy), only 64.3% of adults over 50 have been screened. The inevitable result of low screening is a high number of new cases of colorectal cancer (3rd in the U.S.) and the 4th highest mortality rate among states. LDH Secretary Dr. Gee spoke to Jim Engster on Talk Louisiana this week and shared her thoughts on Medicaid expansion, budget cuts and more. Listen to her full interview. Kick Butts Day is an annual celebration of youth leadership and activism in the fight against tobacco use. Schools across America participate in interactive activities and events that empower youth to stand up, speak out and seize control against Big Tobacco – and commit to stay tobacco-free. 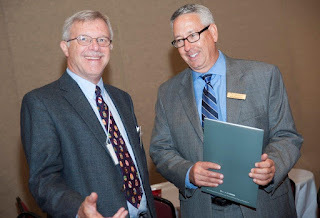 When I began my career, as a direct support professional in the field of disability services more than 20 years ago, one of the biggest challenges facing families and individuals with disabilities who were seeking services was the Request for Services Registry. Most people called this the waiting list for the NOW waiver (New Opportunities Waiver). Today, in my role as the Assistant Secretary for the Office for Citizens with Developmental Disabilities, the waiting list, which is approaching 15,000 people, is still an issue. I recognize that change is needed and I'm pleased to share news about the progress we've made. Over the last several years, the Office for Citizens with Developmental Disabilities has been working in collaboration with recipients, families, advocates and stakeholders to improve our service delivery system through a system transformation initiative. Our staff has been aggressively pursuing a variety of best practices that will allow us to serve more people in home and community-based settings. Critical to this is addressing the waiting list through our Request for Services Registry Screening Project. Through this project, we'll be able to better understand the needs of those waiting and ensure they are directed to other helpful resources and services. As the Louisiana Department of Health undertook Medicaid expansion in 2016, we focused on making the process as efficient and transparent as possible. 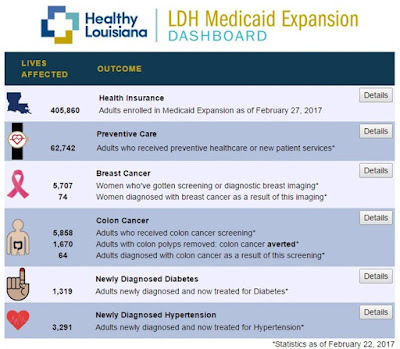 To demonstrate the outcomes and success of expansion, Dr. Rebekah Gee, Secretary of the Louisiana Department of Health, challenged the agency to build an online dashboard to present real-time data in an easy to understand format. Taking up Dr. Gee’s charge, a team was formed that leveraged the expertise of Medicaid leaders, data analysts, developers, and communications staff. Medicaid expansion is covering hundreds of thousands more working adults and ensuring they have access to primary care. 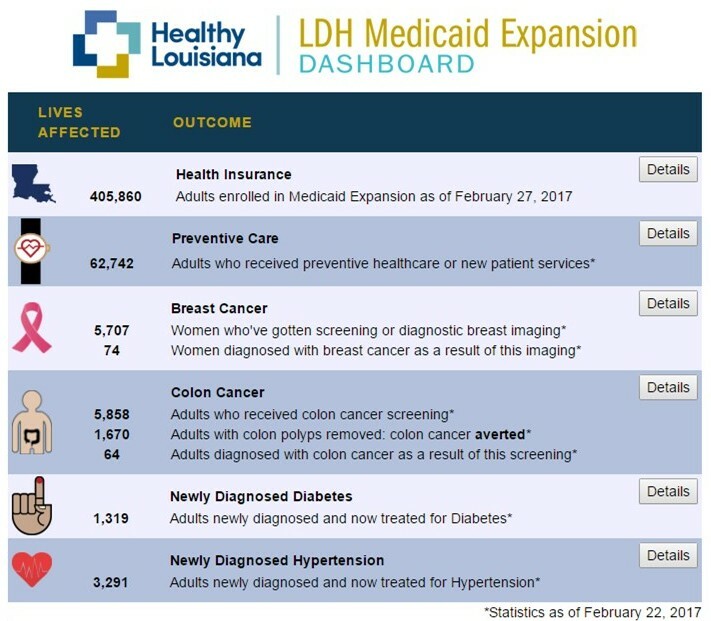 In addition, Medicaid Expansion is bringing in more federal tax dollars to our state and saving Louisiana taxpayers $184 million. Louisiana is ranked first in opioid prescribing of all 50 states. The Louisiana Department of Health continues to work with partners throughout the state to address the opioid epidemic and develop potential solutions. The State of Louisiana recently issued a “standing order” for naloxone. Naloxone is an antidote medication that reverses an opioid overdose. Used by medical professionals for years, naloxone is the most effective way to counteract an overdose and save lives.